Pumpkin seeds are the hull-covered kernels that grow within not only pumpkins, but also most other winter squash. They can be purchased dry roasted from your local supermarket, or roast your own at home - no more than 15 to 20 minutes to maintain their highest nutrition! Also known as pepitas, they're native to South America, where they have been prized and eaten for thousands of years. As far back as 10,000 years ago pumpkins were a part of the ‘three sisters’ - squash, maize and legumes - so often found in ancient agriculture. 4000 years ago the Aztecs prized its medicinal properties as an anti-microbial. Modern research has confirmed this and other benefits of pumpkin seeds! The use of this seed traveled by trade routes to Europe and Asia where it became a popular ingredient in the cuisine of the Middle East, Greece and China! Pumpkin seeds are rich in vitamins, minerals, essential fatty acids, B-complex compounds and phytonutrients! 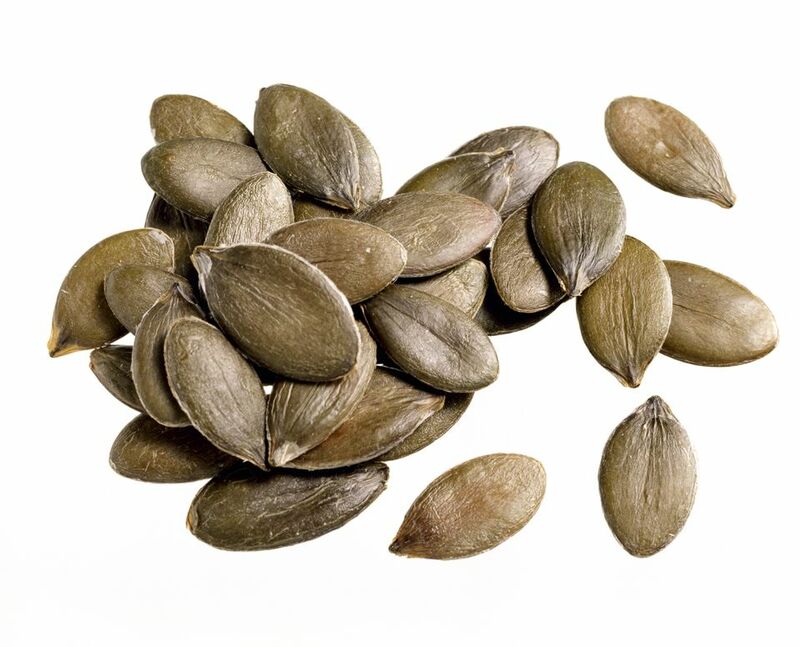 Zinc is one mineral that is exceptionally high in the pumpkin seed. Zinc helps fight prostate cancer, benign prostatic hyperplasia and symptoms of the cold and flu. Lignans in pumpkin seeds have recently received attention not only for their possible role in fighting prostate cancer, but breast cancer as well. Various unusual forms of vitamin E have been recently found in pumpkin seeds which strengthens our immune system as well as our skin and eyes. Pumpkin seeds are also rich in the minerals manganese, magnesium, phosphorus, iron, copper and selenium. Manganese helps us fight infectious diseases and lower bad, or LDL, cholesterol. It also helps prevent anemia and may even assist in the formation of strong bones. Manganese is an essential mineral for processing carbohydrates, protein and cholesterol. Pumpkin seeds are even a great source of protein! This yummy snack provides a wealth of B-complex compounds including niacin, folates, riboflavin, thiamin, pyridoxine and pantothenic acid. These are essential for the production of energy, for a healthy digestive system, for the optimal function of our brain, nervous system and memory, for a healthy pregnancy, for fighting anemia and certain cancers, resisting cardiovascular disease, kidney stones, and diminishing the effects of premenstrual syndrome and morning sickness! Phew! Pumpkin seeds also provide tryptophan, often referred to as nature’s sleeping pill! Tryptophan helps fight depression. Lowered levels of this neural phytonutrient have even been associated with bipolar disease and obsessive-compulsive disorder (OCD)! Consider pumpkin seeds the next time you make your juice or smoothie not only for their nutritional benefits but for their delicious flavor! Combine all of the ingredients in a blender and process until smooth. Add more milk or milk alternative for a thinner consistency. Surprising Benefits of Adding Artichokes to Juice & Smoothie Recipes!